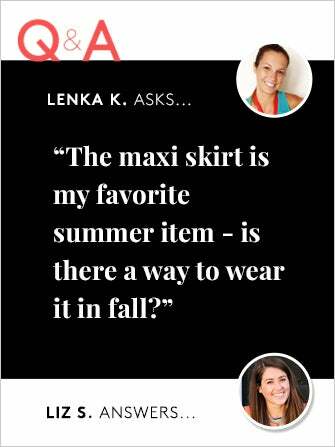 Fall is all about layers so instead of reaching for your favorite pair of skinnies, opt for a maxi skirt. Just add a cozy knit sweater and top it off with your favorite utility jacket and a bright scarf. If you want to glam up your look, I'd try a peplum top to add some shape, a pair of flat booties, a statement necklace, and a cool leather jacket. Soon you'll be able to order your pumpkin latte in your perfectly styled-for-fall maxi. HELMUT Helmut Lang Kinetic Jersey Maxi Skirt, $160, available at Net-A-Porter; Madewell Silk Peplum Tank, $69.50 , available at Madewell; Loeffler Randall Felix Stacked Heel Booties, $395, available at Loeffler Randall; Baublebar Maharaja Fringe Strand, $42, available at Baublebar; Joie Kaylie Leather Jacket, $998, available at Joie. Do you have any pressing fashion questions you want answered? Type 'em in and we'll feature your question — and answer! — here on My Stylist.